There's a new plan for 1 Monument Square -- and a long way still to go. That's the big takeaway from Monday's meeting in which the city of Troy and its consultants showed off concept plan for the redevelopment of Monument Square that's centered on a large public plaza. The new plan is the product of a public input process pursued this year in an attempt to create a solid consensus about what to do with the site -- at the heart of downtown Troy -- and then pursue developers interested in following that vision. "Don't get too hung up on the particulars of the design, it's meant to illustrate proportions more than a specific design or specific building materials," mayor Patrick Madden told a packed crowd at the Arts Center of the Capital Region. "And don't get too wigged out at this point about the challenges -- not yet, anyway." The fifth major attempt to redevelop the 1 Monument Square site in the heart of downtown Troy takes another step November 5 with a public meeting to formally present ideas developed during the public planning sessions this past summer. During the meeting, project designers and planners will present a refined concept for the site. Following the presentation, the City, along with the design team, will analyze project costs, available grant funding, and other factors necessary to move the project forward. The City previously held a multi-day workshop to study the site, inviting Troy residents, business owners, employees and the general public to participate in developing a shared vision for the One Monument Square site. The feedback provided during the meetings were used to develop a series of site illustrations which feature significant open public space, two levels of parking, views of the Hudson River, and pedestrian connections down to the adjacent William D. Chamberlain Riverfront Park. Officials have said the idea this time around is to figure out some sort of consensus on how the site should be used before finding developers interested in the site. This next meeting is Monday, November 5 at 7 pm at the Arts Center of the Capita Region (265 River Street). Monday night the city of Troy had a public workshop to kick off the fifth major attempt to redevelop the 1 Monument Square site. Yep, the fifth -- and the old city hall was only knocked down at the end of 2010. Given all that's happened since -- arguments over form and function, allegations of incomplete disclosure, infrastructure complications, legal threats -- what hope is there that this time will be any different? "Oh, you have to hope. We have to hope that it's going to be different," said Troy deputy mayor Monica Kurzejeski. "I think people are ready to come to the table. They're ready to have conversations. It's just the negativity is starting to -- you know, it's starting to be boring a little bit. Now we have to have some positive outreach." Former Troy mayor Harry Tutunjian floated an interesting idea for the 1 Monument Square site on Twitter this week (embedded above). As he followed-up in a reply: "Everyone who skates in Victorian costumes can skate for free." But, if anything, it's good to be thinking about how to use that prime spot for something other than a de facto parking lot. There's gotta be all sorts of ways to activate that space. Maybe show movies there again. Or a wiffle ball tournament (it does kind of look like a baseball diamond). Or art. Or some sort of architecture event (touchy subject). Something more than a blank space in the downtown picture. 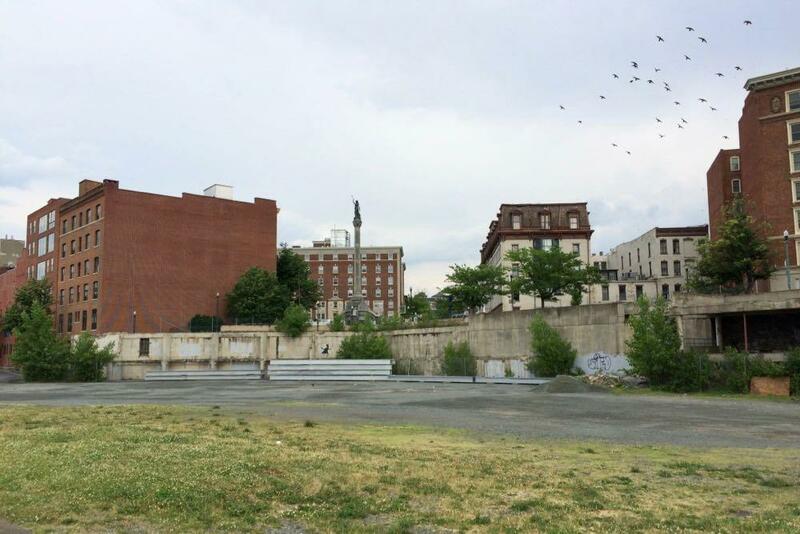 "As a result of multiple and ongoing legal actions brought by a neighboring property owner against the City of Troy, Bow Tie Cinemas has notified the city of their decision to terminate the development agreement for the One Monument Square site. We are deeply disappointed with this lost opportunity to construct a world-class cinema in the Collar City. "For several months, my administration and representatives of Bonacio Construction met on multiple occasions with the neighboring property owner to address his demands, including those not contained within the multiple legal actions filed against the city. Unfortunately, a mutually agreeable resolution to resolve these additional demands could not be reached. "My administration strongly believes the issues identified in the multiple legal actions were solvable, but due to concern over potential future litigation Bow Tie Cinemas opted to end their involvement in the project. The "neighboring property owner" is developer Sam Judge, who himself had once tried to develop something on the site. His early-September lawsuit alleged the Bow Tie project would do "irreparable harm" because of traffic and parking issues. It also argued a full environmental review would be necessary for the project. The Bow Tie project's movement through the city planning process was paused when the lawsuit was filed. Updated with a new set of renderings. 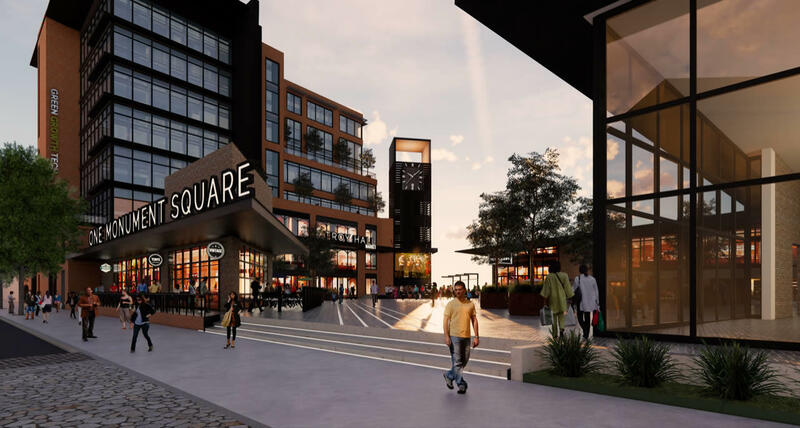 The latest chapter in 1 Monument Square saga arrived at an important plot point Wednesday evening when the proposed movie theater project for the site went before the Troy planning commission. A lot of people turned out for the presentation, and they had a lot to say. That's not a surprise -- this is one of the most high-profile real estate projects in the whole Capital District, and it's the fourth major attempt to get something built at the site. Don't squint -- we've posted the images in large format. The first renderings of the propose movie theater at 1 Monument Square in downtown Troy are out. The city of Troy selected the proposal from two entries earlier this year. The super quick overview: The $18 million project would include a 9-screen movie theater, 3,000 square feet of street level retail space, 100-150 parking spaces underneath, and the potential for additional floors in the future. Bonacio and Bow Tie will also be redeveloping the American Theater space, located 500 feet down River Street from the site. The projected opening date for the 1 Monument Square theater would be the fall of 2018. The site last summer, looking up toward River Street and the square. The city of Troy announced Wednesday that it's selected a plan for the redevelopment of 1 Monument Square: a new Bow Tie movie theater built by Bonacio Construction. 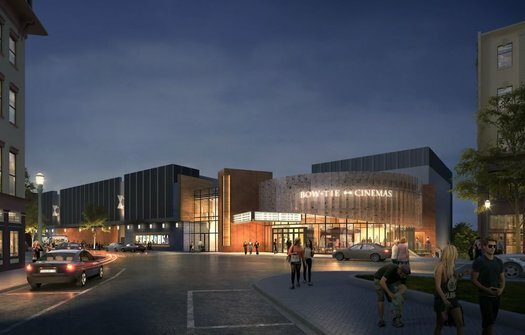 Their proposal to build a nine-screen cinema will strengthen our city's growing economic resurgence while further boosting Troy as a regional destination in the Capital District. With an estimated 10,000 weekly visitors this exciting project will support our downtown restaurants and small businesses while helping to attract additional investment to our community. The city council still needs to approve a development agreement for the 1 Monument Square site, and the project will have to go through the usual planning approval process. The Madden administration is projecting that construction could start in late fall of this year and be completed by late 2018. The project will be the fourth major attempt to redevelop the site on the riverfront in the heart of Troy. The site this past August, looking up toward River Street. 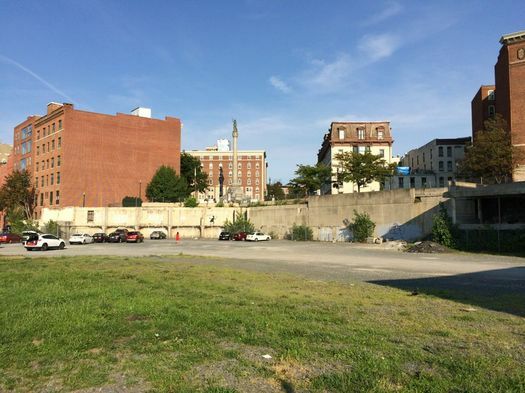 "Now is the time to develop this key parcel in downtown Troy." That's the last line of the opening page of the new request for proposals that the city of Troy posted Monday for the 1 Monument Square site, one of the most prominent pieces of undeveloped real estate in the Capital Region core. The request is looking to spur the fourth major attempt since 2011 to redevelop the old city hall spot. How to move forward at 1 Monument Square? More than a hundred people showed up for a public meeting Wednesday evening in Troy to talk about how to redevelop the 1 Monument Square site. And toward the beginning of the event, mayor Patrick Madden mentioned that the city was hoping to have a request for proposals out to developers sometime early this October. But by the time the event was ending, Madden said his administration would be rethinking the process. What sort of development should happen at the 1 Monument Square site in downtown Troy? [The meeting] will provide residents and city stakeholders an opportunity to participate in a community conversation regarding the future redevelopment of the vacant site and provide their input and ideas in a public setting. "The One Monument Square site is one of Troy's more high-profile properties and an important part of the future of our downtown," said Mayor Patrick Madden. "By further engaging the public on the redevelopment of the property we can foster an important dialogue between business owners, residents, community members and public officials that will be utilized in the development of a new RFP expected to be released this fall." There is, of course, a lot of history and drama involving the development of this site. The most recent turn was this past spring when a proposal to build a mixed-use residential project got as far as the city's planning board before meeting organized opposition from members of the public -- the developer dropped out, blaming what it said was the city's failure to properly identify underground infrastructure that complicated construction and pointing the finger at the organized opposition. That was the third major effort to redevelop site since the former city hall was demolished in 2011. The public meeting is Wednesday, August 24 at 6 pm at the Bush Memorial on the Sage Troy campus. A rendering from one of the last iterations of the current project. 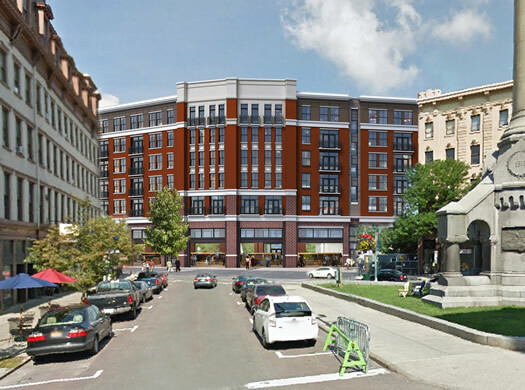 The development company behind the latest effort to build on the 1 Monument Square site in downtown Troy announced Friday that it's pulling out of the $24 million residential/retail project. "Anyone who has been listening to the debate knows that WCATS is a pro-development, pro-design, pro-quality group of invested citizens that values the extraordinary urban and architectural assets of Troy and wants to see the gap in River Street and our city's river faÃ§ade completed in a manner that connects the downtown to the Riverfront, meets the highest standards of excellence in architectural design, and is of the construction quality the city deserves." This ending wasn't really a surprise. From the latest batch of proposed renderings for the project. 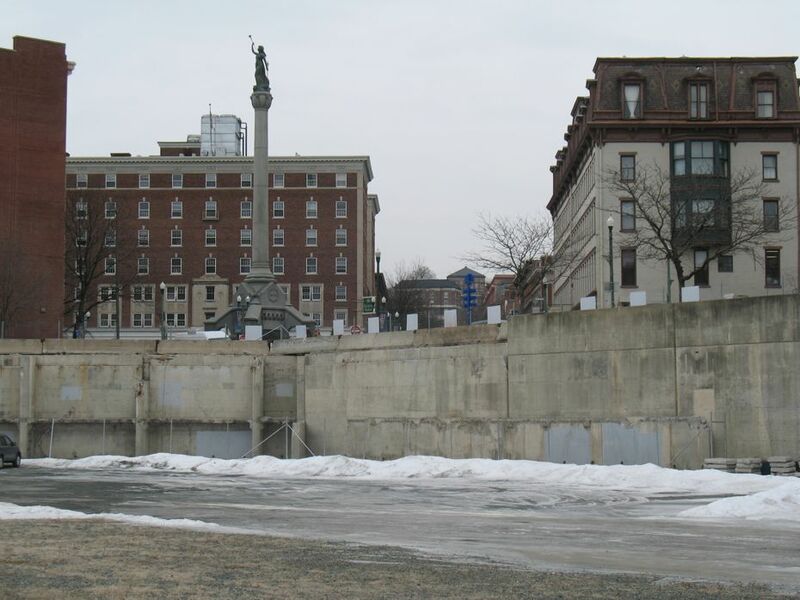 The Troy Waterfront Farmers' Market has announced that it's withdrawing from the proposed plan to redevelop the 1 Monument Square site in downtown Troy. The market had been slated to occupy a street-level retail space in the mixed-used development, as well as make use of surrounding plaza space. 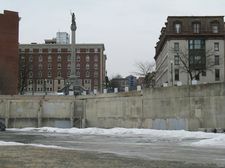 "Changes to the scope of the One Monument Square project greatly reduced the footprint the Troy Waterfront Farmers' Market would have occupied while increasing the cost to the market, and it has become clear the available space would not allow us to offer the ideal experience to customers, nor to our vendors. We understand the developer has encountered major engineering challenges and site constraints as the project has progressed, and we respect that. However, it is our organization's goal to be fiscally responsible in order to ensure all who enjoy the market are able to have a positive experience for years to come." The press release also included a statement from Joseph Kirchhoff, CEO of the Kirchhoff Companies, which has been working to develop the project with Sequence Development: "We know that our project when completed will be an outstanding addition to downtown Troy, enhancing the quality of life for both existing and future Troy residents. We will continue to support the Market at its downtown location and look forward to the Market vendors taking advantage of the public plaza created around the future One Monument Square building." This news isn't that surprising. One of the latest renderings. 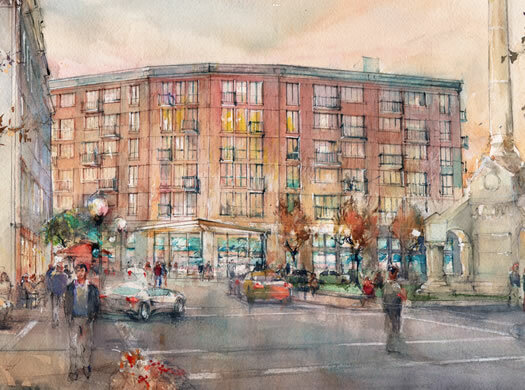 The development team backing the 1 Monument Square project presented the latest iteration of the mixed-use building to the Troy planning commission Wednesday night. The presentation included new renderings, a somewhat reconfigured plan for the river side of the building, and some discussion about what the space that has been set aside for the Troy Waterfront Farmers' Market might (or might not) be. And then things took a bit of a turn toward the dramatic. An attorney representing a group called We Care About the Square stood up for the first public comment of the night and raised the possibility of legal action if the project moves forward. One of the exterior options presented. The latest iteration of the third major attempt to redevelopment the 1 Monument Square site is down to a one building. The development team aiming to build a residential/restaurant/farmers' market project on the prime spot in downtown Troy presented its latest plan Tuesday night to the Troy Planning Commission. 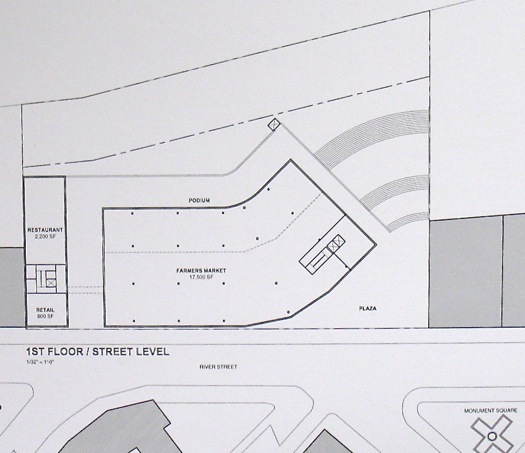 And the commission gave the site plan a preliminary approval.